Food for thought: An idea or issue to ponder… This metaphoric phrase, transferring the idea of digestion from the stomach to mulling something over in the mind, dates from the late 1800s, although the idea was also expressed somewhat differently at least three centuries earlier. 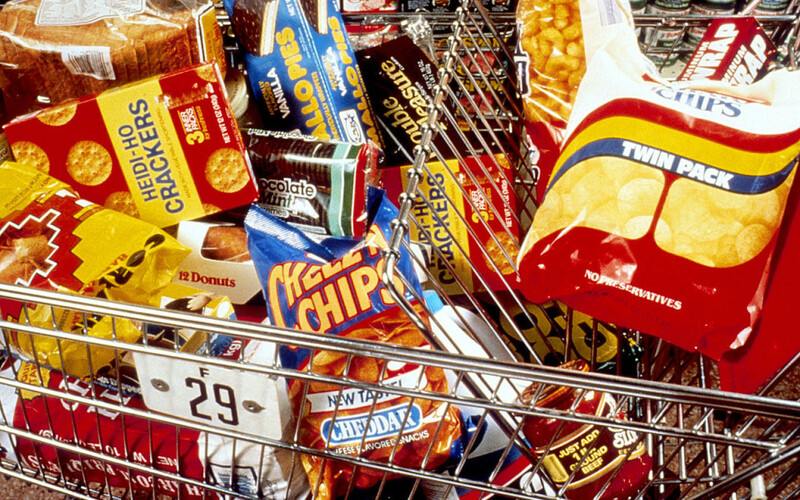 Junk food: 1. food, as potato chips or candy, that is high in calories but of little nutritional value. 2.anything that is attractive and diverting but of negligible substance. We know all too well the perils of junk food. Imagine a world in which junk food was available for a small monthly fee. Fee paid? You can then eat junk food in unlimited amounts. Imagine further that junk food was freely and openly available everywhere. And that it was perfectly tailored to your preferences. Everywhere. Imagine walking through urban streets with junk food of every description in open bins at arm level. Take a step, grab some pretzels. Another step or two, CheezIts or Twinkies. Further down, cotton candy. On the opposite corner, Doritos. Oreos. Sliders. Sugary soft drinks. Unlimited amounts, endless variety, as far as the eye could see, block after block. Don’t like jalapeno crackers? They’re nowhere in your field of view. But if your sidewalk companion can’t get enough of them, that’s all he or she sees. You’d find the same food available in elevators. In parks and at home. In your office or at your factory workplace. It would be at hand in shopping malls, in schools and churches. And even – wait for it – the gym. Of course some food might not be so universally or quickly accessible, or in such variety, depending on your junk food provider. You might find yourself in places where coverage wasn’t available. Fortunately, you and I don’t live in this alternate universe. Otherwise obesity, and type-2 diabetes, and cardiovascular problems would be even more pervasive than they are today. But our actual universe does pose a similar, perhaps great threat, in the form of our smartphones. Smartphones provide us endless junk food for thought. Once upon a time to be walking on city streets was to be focused on the minutes remaining to our destination, or the people we would be meeting there, or the purpose of that meeting. How boring! How limiting! Today we can multitask. We can let our minds roam on thoughts entirely separate from the task almost-but-not-quite-at hand. We don’t even have to notice the crack (or pothole) in the sidewalk that awaits our next step. And (I am not making this up), technology is in the works to cast a red or green light on the sidewalk beneath our feet at intersections, so that soon we won’t even have to look up from our phones to see whether it’s safe to cross the street. Our mind can be half a world away, checking last night’s (or up-to-the-minute) sports scores, the value of our company’s stock, generating adrenalin in response to the latest political tweet, watching today’s top cat video, bonding with the Kardashians, getting updates from friends and family, e-mails from the boss, and more. Fact is, we’re also generating such content. When we talk about junk food, we usually draw a contrast to some desired healthy diet balancing the “basic” food groups: breads, cereals, rice, pasta, noodles and other grains; vegetables and legumes; fruit; milk, yoghurt, cheese and/or alternatives; lean meat, fish, poultry, eggs, nuts and legumes. Food deserts are defined as parts of the country vapid of fresh fruit, vegetables, and other healthful whole foods, usually found in impoverished areas. This is largely due to a lack of grocery stores, farmers’ markets, and healthy food providers. A brief historical digression, important for context. A century before the Internet, William James introduced the term “stream of consciousness,” referring a an individual’s a person’s thoughts and conscious reactions to events, perceived as a continuous flow. The idea even gave birth to a literary style, made famous by James Joyce, Virginia, Woolf, and Marcel Proust, in which a character’s thoughts, feelings, and reactions are depicted in a continuous flow uninterrupted by objective description or conventional dialogue. So you could argue that the Internet introduces little that’s new. But it feels like the Internet-fueled stream of consciousness is more like an angry river at flood stage. We’re being carried along – to where? When I look at my Internet use, to what extent am I consuming junk-food-for-thought? What constitutes nutritious food for thought? Is there such a thing as “basic” food-for-thought groups? What are they? Can and does my intake of that nutritious food for thought need to be balanced in some way (including portions, say, of education in the latest breakthroughs in my profession; emerging ideas in related professions; in self-help; spiritual matters and values; etc.)? There’s no doubt the Internet allows me to respond more rapidly to short-term, urgent needs; how does affect my ability to think strategically versus in the moment? And, expanding to the larger society (while inching closer to home for LOTRW readers) what are the implications of this for a society wrestling with defining, long-term challenges such as sustainable production of food, water, and energy? What are the implications of this for public education? In sum, how can I master the Internet to serve my own (larger, healthier?) ends versus allowing the Internet to master me? Confessing the obvious: this feels more like scratchwork to me than the majority of the LOTRW posts. I haven’t just failed to reach any satisfactory conclusions; I’ve not yet been able to formulate the right questions. Yet to pursue this on my own means being carried by that stream of consciousness into a swamp, to be entangled in a thicket of unstructured and useless thought. Therefore putting these unfinished thoughts out there/would really welcome your views. (Junk?) food for thought for what’s left of your weekend. Bill: At least for the short time it took to read this post, my screen – hence my mind – was filled with substance and not junk. Thank you for this nutritious food for thought. Thanks for the words of encouragement, Jon… and I have to confess, I’m partial to each of the junk foods I mentioned, including those sliders. All the people who make the tools or messengers for this junk content all put away their technology and limit its use. They have had it the longest and know what the double edged sword feels like first. Seems we have a problem thinking through the consequences of the tech and content we construct, curate, and consume. Fun times.